The FN F2000 is a 5.56×45mm NATO bullpup assault rifle, designed by FN Herstal in Belgium. 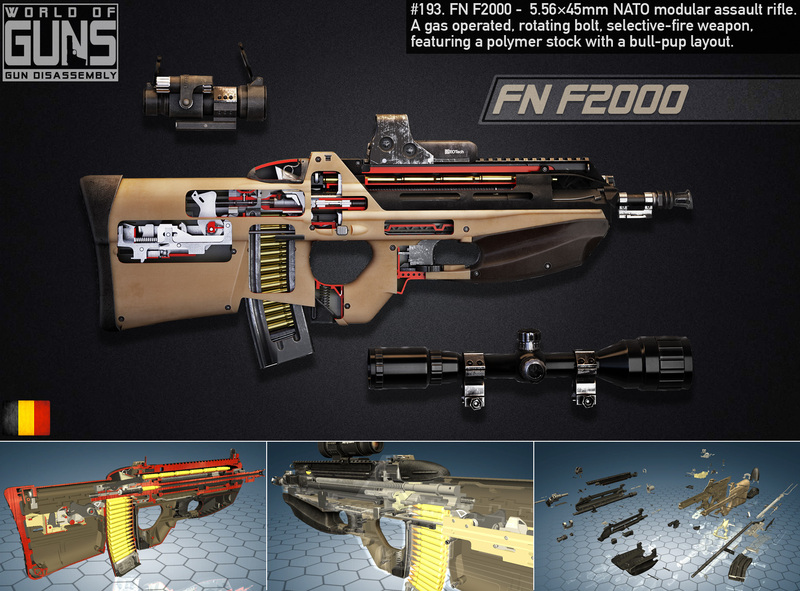 The F2000 is a modular weapon system; its principal component is a compact 5.56×45mm NATO-caliber assault rifle configured in a bullpup layout. The F2000 is a selective fire weapon operating from a closed bolt. The rifle consists of two main assemblies: the barreled receiver group and the frame, coupled together by means of an axis pin located above the trigger guard. The barrel group has an integral MIL-STD-1913 Picatinny rail used to mount optical sights. The frame or lower receiver contains the trigger group, the bolt and bolt carrier assembly, return mechanism and magazine well. A removable handguard is installed in front of the trigger which completes and encloses the trigger guard. 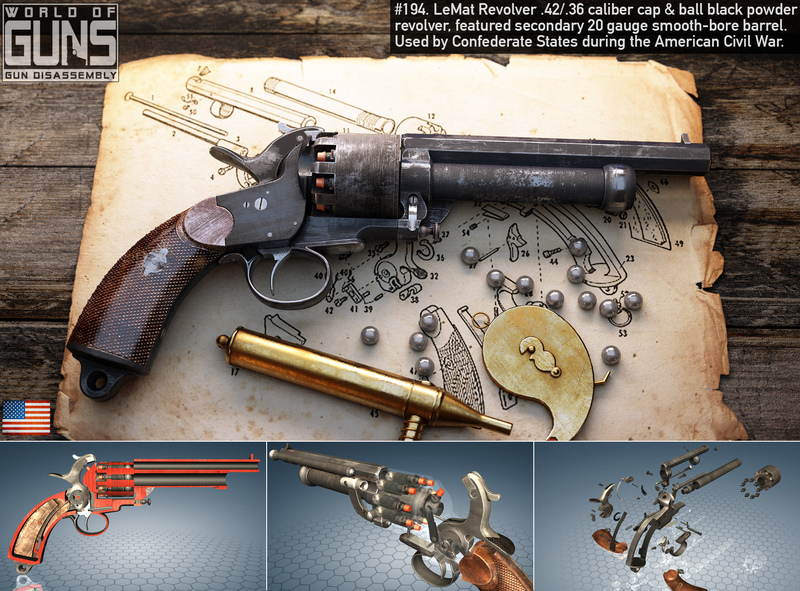 The LeMat revolver was a .42 or .36 caliber cap & ball black powder revolver invented by Jean Alexandre LeMat of New Orleans, which featured an unusual secondary 20 gauge smooth-bore barrel capable of firing buckshot. It saw service with the armed forces of the Confederate States of America during the American Civil War of 1861–65 and the Army of the Government of National Defense during the Franco-Prussian War. 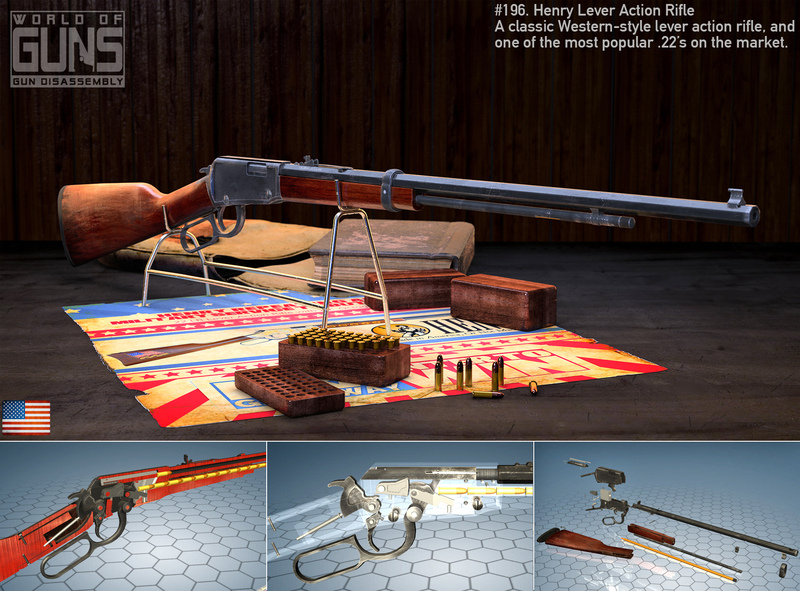 The Henry repeating rifle is a lever-action, breech-loading, tubular magazine rifle famed both for its use at the Battle of the Little Bighorn and being the basis for the iconic Winchester rifle of the American Wild West. Designed by Benjamin Tyler Henry in 1860, the Henry was introduced in the early 1860s and produced through 1866 in the United States by the New Haven Arms Company. It was adopted in small quantities by the Union in the Civil War, favored for its greater firepower than the standard issue carbine. Many later found their way West, notably in the hands of the Sioux and Cheyenne in their obliteration of Custer's U.S. Cavalry troops in June 1876. The Remington-Beals Model Revolvers along with subsequent models and variations were percussion revolvers manufactured by Eliphalet Remington & Sons in .31 (Pocket) .36 (Navy) or .44 (Army) caliber, used during the American Civil War, and was the beginning of a successful line of medium and large frame pistols. It is commonly, though inaccurately, referred to as the Model 1858 due to the patent markings on its cylinder, "PATENTED SEPT. 14, 1858/E. 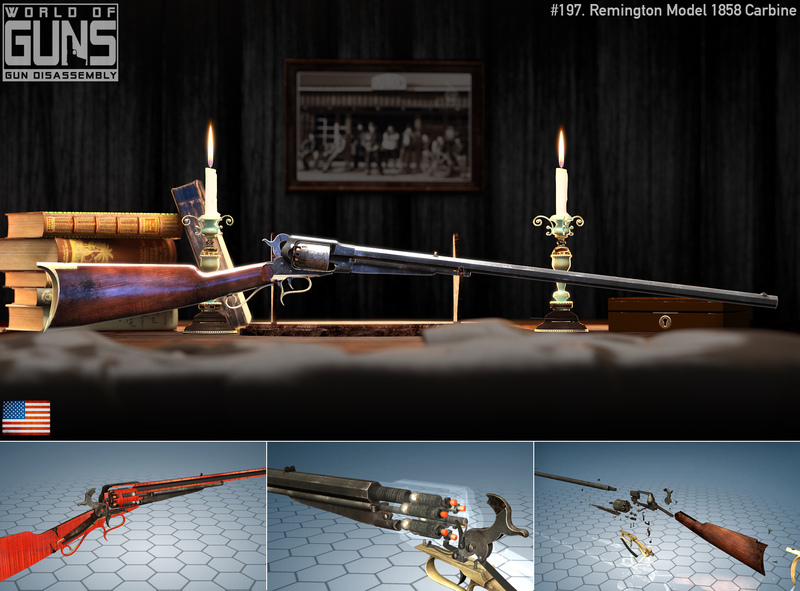 REMINGTON & SONS, ILION, NEW YORK, U.S.A./NEW MODEL. "; although wide scale production did not start until 1861. The Remington revolver was a secondary, supplemental issue firearm for the Union Army until the Colt factory fire of 1864. Due to the fire the Colt 1860 Army was not available for some time, subsequently large numbers of the Remington revolver were ordered by the U.S. government. It was more expensive, by "50 cents" (a difference of more than US$12 in 2013 dollars), than the Colt, but those who could afford it remarked on its durability. 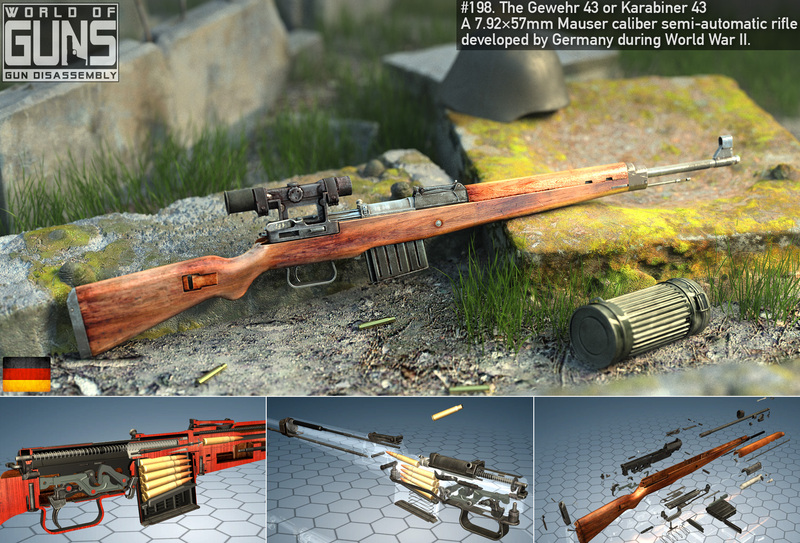 The Gewehr 43 or Karabiner 43 (abbreviated G43, K43, Gew 43, Kar 43) is a 7.92×57mm Mauser caliber semi-automatic rifle developed by Germany during World War II. The design was based on that of the earlier G41(W), but incorporating an improved short-stroke piston gas system similar to that of the Soviet Tokarev SVT-40, and it incorporated innovative mass-production techniques. 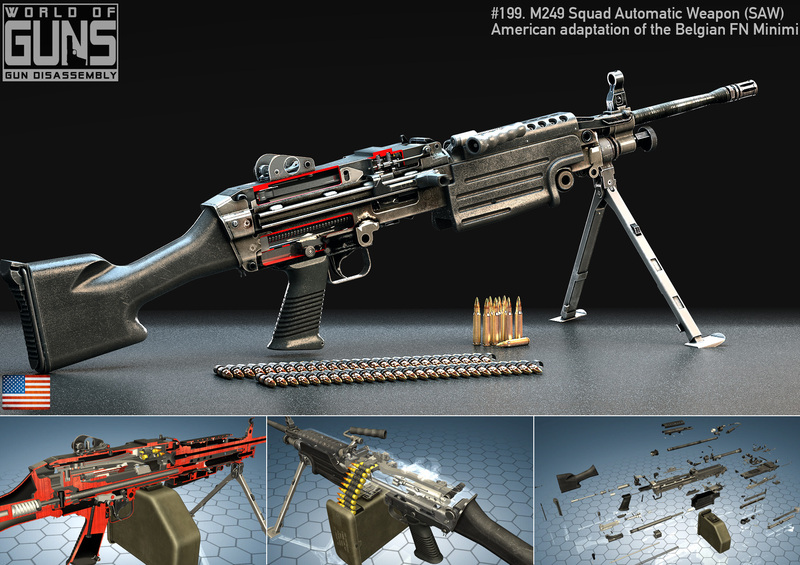 The M249 light machine gun (LMG), formerly designated the M249 Squad Automatic Weapon (SAW), and formally written as Light Machine Gun, 5.56 mm, or the .223 military rnd. The M249, is the American adaptation of the Belgian FN Minimi, a light machine gun manufactured by the Belgian company FN Herstal (FN). The M249 is manufactured in the United States by the local subsidiary FN Manufacturing LLC in South Carolina and is widely used in the U.S. Armed Forces. The weapon was introduced in 1984 after being judged the most effective of a number of candidate weapons to address the lack of automatic firepower in small units. The M249 provides infantry squads with the high rate of fire of a machine gun combined with accuracy and portability approaching that of a rifle. 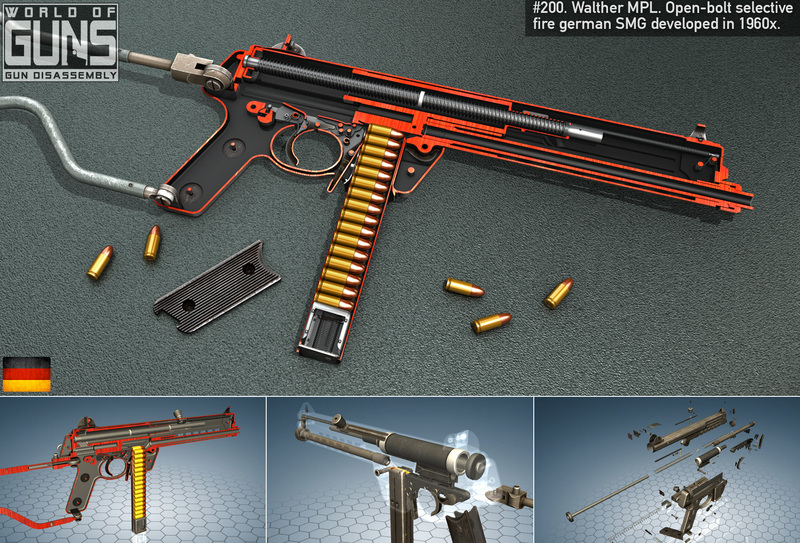 The Walther MP (Maschinenpistole) series is a family of 9×19mm Parabellum submachine guns produced in West Germany from 1963 to 1985 by Walther. 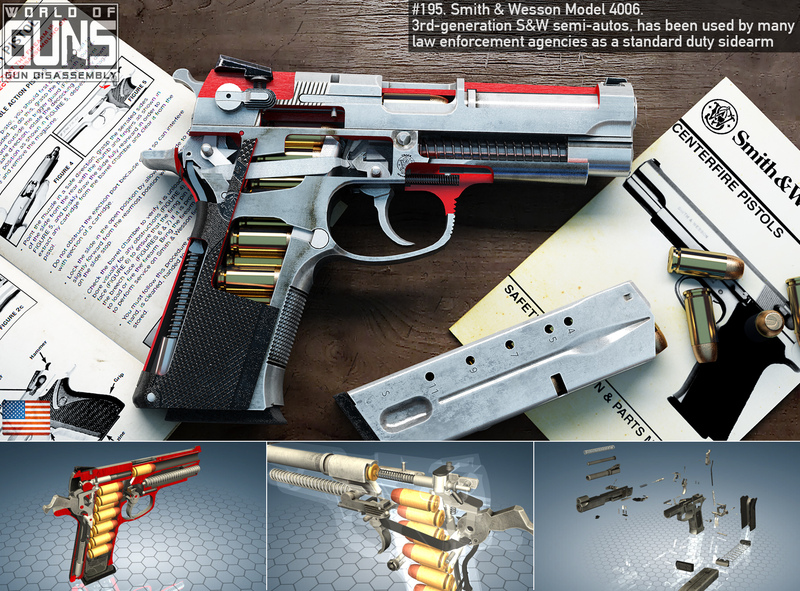 The P7 is a semi-automatic blowback-operated firearm. 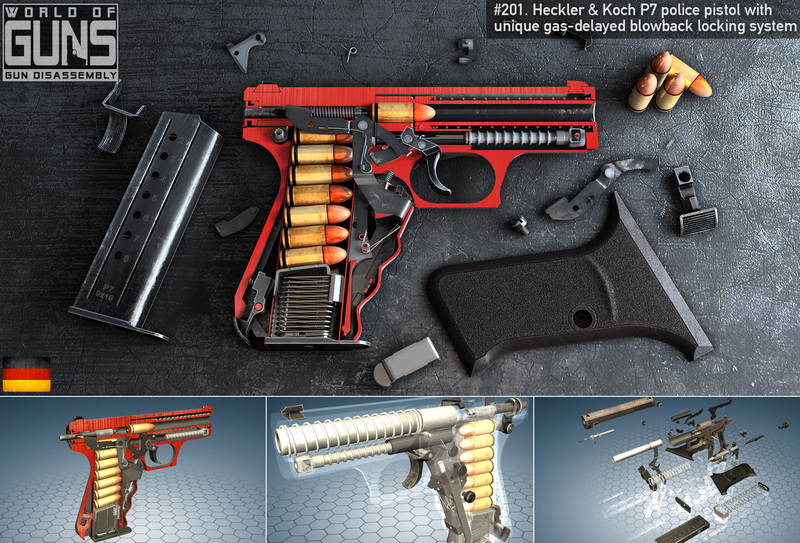 It features a unique gas-delayed blowback locking system modeled on the Swiss Pistole 47 W+F (Waffenfabrik Bern) prototype pistol (and ultimately on the Barnitzke system first used in the Volkssturmgewehr 1-5), which used gas pressures from the ignited cartridge and fed them through a small port in the barrel (in front of the chamber) to retard the rearward motion of the slide. This is accomplished by means of a piston contained inside a cylinder located under the barrel that opposes the rearward motion of the slide until the gas pressure has declined—after the bullet has left the barrel—hence allowing the slide to end its rearward motion, opening the breech and ejecting the empty cartridge case. The Chauchat, named after Colonel Louis Chauchat, the main contributor to its design, was the standard machine rifle or light machine gun of the French Army during World War I (1914–18). 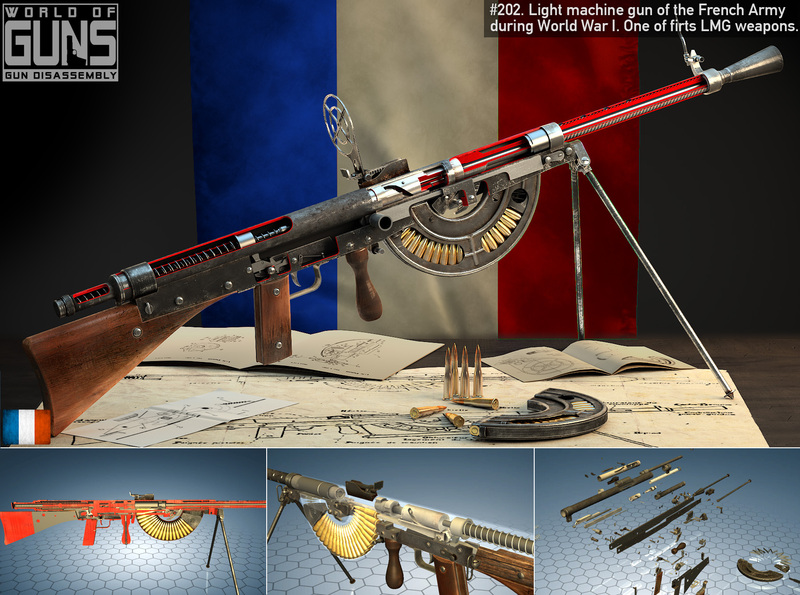 Its official designation was "Fusil Mitrailleur Modele 1915 CSRG" (in English: "Machine Rifle Model 1915 CSRG"). Beginning in June 1916, it was placed into regular service with French infantry, where the troops called it the FM Chauchat.